Sage Intacct Advantage 2018 – the future is bright! Sage Intacct Advantage continues to provide an excellent forum through which all Sage Intacct stakeholders enrich themselves by building relationships, gaining product knowledge, learning best practices, and staying abreast of accounting software and technology development. Five professionals from BTerrell have just returned from the 2018 version of this well-regarded event, and the future for all Sage Intacct stakeholders has never looked brighter! As always, Sage Intacct features information from and access to top Sage Intacct executives throughout the week-long event. Rob Reid, Executive Vice President and Managing Director, shared how Sage Intacct enjoys a 98% approval rating on G2 Crowd, the crowd-sourced end user review site that does not accept paid endorsements. BTerrell knows customers enjoy using Sage Intacct based on our own net promoter scores; however, the measurements collected and posted by G2 Crowd provide additional evidence both Sage Intacct and BTerrell are on the right track. In addition, Sage Intacct Advantage 2018 provided ample opportunity throughout the week for our group to sample informal, anecdotal evidence from others to back up Rob’s claims that customers are indeed happy. Attendees always appreciate hearing from Aaron Harris at Sage Intacct events. This year, Aaron, who is Sage’s Senior Vice President and Head of Engineering and Technology, painted a future in which Sage Intacct promises to completely change the nature of financial audits. Audits continue to be projects summarizing financial history, which keep accounting professionals from lending strategic advice to their firms. How will Sage Intacct impact the future of attest and compliance work? According to Aaron, the addition of artificial intelligence and robotics to Sage Intacct’s always accessible cloud platform will create a continuous, proactive audit process greatly minimizing the amount of “looking back” required. For BTerrell, we get excited when previewing new technology at Sage Intacct Advantage. This year, the Sage Intacct Interactive Custom Report Writer emerged from a year-long beta testing process as an included feature in the company’s upcoming November Quarterly Release. The new module creates a drag and drop powerhouse reporting tool that reorganizes and summarizes data with pivot tables and rich formatting tools. Over 800 attendees signed up for training on this highly anticipated module during the week-long event. In addition, Sage Intacct announced Sage Intacct Budgeting and Planning to provide a collaborative planning tool that includes forecasting capabilities. Both of these products made a splash for everyone attending the conference. 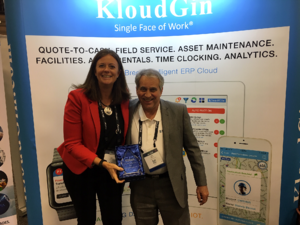 Finally, Kloudgin recognized BTerrell for our partnership to bring their cloud-based, fully integrated Field Services application to Sage Intacct users. Kloudgin enjoyed a prominent position on the always expanding tradeshow floor, and we enjoy walking around to meet these many third-party software providers that add value to the Sage Intacct ecosystem. Don Zelezny, Director of Business Development at BTerrell Group, accepted the Kloudgin Partner Recognition award from Kloudgin’s own Julie Stafford. The support Sage Intacct receives from software development firms world-wide provides additional incentive to attend Sage Intacct Advantage and place a face with a name. We’ve been attending software publisher events for over 27 years, and Sage Intacct Advantage 2018 ranks as one of the best produced events we’ve ever seen. Once again, the people, the technology, and the culture make it clear that the Sage Intacct future continues to shine very brightly! nally, Kloudgin recognized BTerrell for our partnership to bring their cloud-based, fully integrated Field Services application to Sage Intacct users. Kloudgin enjoyed a prominent position on the always expanding tradeshow floor, and we enjoy walking around to meet these many third-party software providers that add value to the Sage Intacct ecosystem. The support Sage Intacct receives from software development firms world-wide provides additional incentive to attend Sage Intacct Advantage and place a face with a name.